So, I couldn't be happy until I bought and started this book. I was going to wait to get it from the library, so I tried to read 3 other books, and wasn't feeling it. So I put myself out of my misery and bought it. Then I read the summary, and I knew that more heartache and trouble were in store for Aria and Perry, but I just had to see more of their romance and find out what happens next. The characters did not let me down, they continued to be amazing and blow me away. I couldn't stop thinking about them and this world. Every time I had to put down the book I was thinking about Aria and Perry and Roar in the back of my mind and this beautiful but dark and treacherous world that Ms. Rossi has created. There were times that I wanted to cry, and I couldn't believe the obstacles and heart ache that happened. There were others that made me smile and still others that made me want to fan myself. Or possibly zap myself into Aria's shoes so I am there with Perry. There were other moments that I wanted to smack some sense into them because of the choices, or almost VERY bad decisions made. But luckily my rage wasn't waranted at the specific moment where I was ready to give up on my book boyfriend. Perry’s hand settled on her hip, his grip firm. She felt their kiss shift into something deeper as his mouth moved with more urgency over hers. Suddenly there was real heat between them, and she had to force herself to draw away. When she did, a soft curse slipped through Perry’s lips. His eyes were half-lidded, unfocused. He looked as overcome as she felt. Aria leaned by his ear. “We’ll pick that up when we’re alone. Yeah. Hose me down now. But I digress. The twists were amazing, and I was shocked that the unlikely alliance that formed, and also very glad to see the return of some of the characters that I liked a lot but wasn't sure I would see again after the end of the first book. The depth of the characters just really amazes me. They are so complex and they really found a way into my heart. I learned so much more about Perry in this one, and it was such a joy to be in his head. It was difficult watching him grow into the position of Blood Lord, but it was worth every minute. I just loved the devotion and loyalty in this book. The measures that Aria and Perry would not only take for each other but their friends such as Roar and Cinder, and the people that they are connected to by leadership, family, or place they grew up. And while I loved Roar in the first book, he has gone to a whole other level in this one. He never fails to bring a smile to my face, but knowing he is in so much pain makes my heart hurt too. His friendship with Aria deepens even more in this one, and I really appreciate that. It is not a love thing at all, but shows the depths that you can care for someone without being IN love. This series has worked its way into my top ten and maybe even higher. Aria and Perry's romance is up there with my favorite couples and the cast of secondary characters, esp Roar is there as well. I appreciated the continuing world building in this one, especially a more detailed description of the aether. I can picture this world in my head and feel myself right in the story with the characters. The pacing was great. There was always character development or action to keep things moving, and I almost wanted to press slow motion at times to savor the happy and together moments of Aria and Perry before the next impending disaster. Because you know there will be one. While I of course am still craving more of this world and of Aria and Perry, I think that Through the Ever Night ended at a good spot and it didn't make me want to through my kindle because it felt like it stopped in the middle of a chapter, like some books do with cliffies. It was heart breaking though!! Bottom Line: Loved it even more than the 1st. Perfection. Lots of character growth, swoon moments and heartache. Would you leave if your lover's people didn't accept you? Great Review! I only recently read book one and I was pleasantly surprised although my expectations were somewhat high. I'm really to see that the sequel won't disappoint. I love Roar is just so sweet. Roar took on a life of his own, and I loved it. Alright. Now I have to read it. Hope you enjoy. Thanks for stopping by. Great review! I'm actually reading this one and I hope I'll enjoy this as much as you did! I am dying for the next one! Now I do like the sound of this. Great review, thanks for the recommendation. One of your top ten series and ya need to be hosed down..ok what am i doin? I have book one of this series and keep kicking it around..I have a feeling I am going to be kicking myself soon. I need to meet this couple. Awesome review and I am glad you grabbed it! I don't want to read your review yet, but your rating has me dying to read the sequel! I can't wait :) I'm dying to get back into the world and the characters! that's so funny that you couldn't help reading this one. i've had that happen before. wow that much? you'll make me try it at the end. I got a stack of dystopians from the library including Under The Never Sky. Of all the books, I never thought it would be that won I would love but I did. 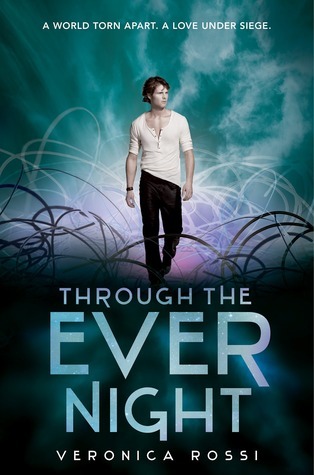 Through The Ever Night Was fabulous and I just finished the novella Roar and Liv. I can't wait for the 3rd book to come out. I'm hit or miss with Dystopia but I must say I love this series. Roar's name alone is so cool and the side characters are so wonderful. For a change, this didn't remind me of Hunger Games, VRossi made a truly unique Dystopian novel. I am a little nervous to read this book if it made you want to cry but as long as it's as good as you say it is, I am all over it. What? "When we're alone" ? Were they not alone? So I guess Aria's world is out of the picture completely now. I really want to know more about it. About the question, does that mean they don't accept her? I wonder what she does, I don't know of she left or stayed there, or wanted to leave but Perry convinced her not to. I'd feel bad staying there. I remember when I thought that about the mother of the guy I like, I kept thinking she didn't like me, so I was obviously not comfortable around her. That's awesome you loved it so much! I haven't read these, but I keep hearing great things. I got this one when it first came out but still haven't managed to read it! I'm glad that it was amazing though and hopefully I can fit it in really soon! I wouldn't leave the kind of love those two have no way! They couldn't drag me away, and Perry wouldn't let them. I think he'd give up Blood Lord before he let that happen. Maybe. I hate that they have to be so practical about things. I loved when you wrote "Yes. Hose me down now." I felt the same way! I love this series!! I love how Aria and Roar are friends without making it a whole stupid love triangle. It's so refreshing. Wonderful review, Brandi! I still haven't read it, but I hope to do it soon because I really loved the first book! YES! You make me want to read this one again. Gosh, such great scenes between Aria and Perry where I felt like I was sighing every minute. Then ROAR. Man, I wanted to hug him. I loved the devotion also and...just your overall review! Great job! I'm so glad you loved it! I have this on my tbr pile and I loved the first book so I will pick it up soon. Loved the teaser! I guess Through the Ever Night is bound to be more swoonworthy. :) Thanks for the great review!